We started the school year looking for new ways to collaborate beyond the walls of our building. We investigated the opportunity with the Rocky View School Division. Acknowledging that collaboration is more than linking people through curriculum, Darrell Lonsberry, and Dan McWilliam met with Josh Hill from RVSD and identified 3 stages or levels of collaboration for a Cross Authority AISI project. As described by Ivy Waite, "Collaboration is more than just sharing ideas, but the process of working together to achieve a common goal. True collaboration is a process in which two or more people co-conceive, design, execute and reflect upon teaching and learning. It is this process that ensures our students are engaged in meaningful, authentic, engaging, inquiry based learning." 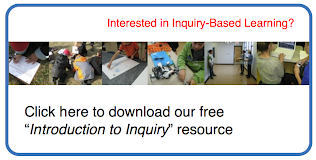 What could an inquiry unit in PE look like? At CSS, we challenged all 600 students from grade 4 to grade 9 to explore the question, “To what extent does training affect performance?” Each student was given the opportunity to choose a sport or activity that they were interested in, and then create a plan to improve a specific skill in that sport or activity. How the students chose to use their time over the course of the unit was entirely up to them. They had access to all the resources that CSS has for physical activity. The rubric was created collaboratively between teachers and all the students in the school over the first two days of the unit. We began a recent investigation into Light and Shadows in Grade 4 by posing the question “What is Light?” to our students. Before beginning the conversation, we reminded students that the world is not nearly as concrete or easily-understood as over-simplified statements of "fact" might often imply. We talked about how scientists are by nature inquisitive, always open to possibility and a reinvention of old ideas. We suggested that throughout our inquiry, they too might have the potential to share a completely new perspective, contribute to making new discoveries and either support or disprove current thoughts. With two of us in the classroom, we were able to capture some of our students’ opening ideas about 'Light' and have embedded them below. Engineering. As part of her Master’s research, Emily has gone around to various schools conducting a set of electricity modules for project based learning. This turned out to be a wonderful partnership, in which Emily could conduct her research with 100 willing students and our school community benefited from her expertise, enthusiasm and hands on approach. All of the modules were well thought out and aimed at building understanding of concepts related to electricity through hands on exploration. Emily used STEM - Science, Technology, Engineering and Math with a focus on helping students understand what Engineers really do. Students were engaged in various learning experiences with curricular links extending beyond science and into technology, art and social studies and language arts. Rick Fawcett and Jared McKenzie~ Grade 7 Humanities. This project was designed as a way to share the personal connection the students have to Canadian history and to engage them in the process of curating a historical narrative of their own family's history.